Prominent Clergyman Apostle Dr James Madzimure has prophesied that MDC leader Nelson Chamisa must listen to the advice of his wife so as to secure the Presidency in the coming MDC congress pencilled for May. 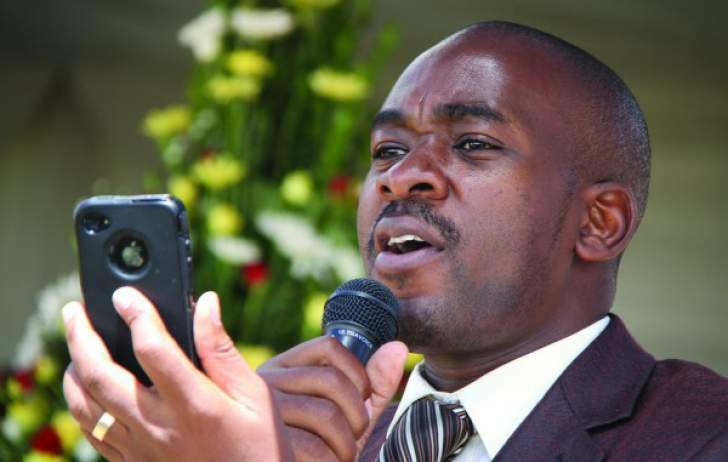 In a Prophecy posted last week on Youtube, Madzimure said God has deposited wisdom and understanding in Chamisa's wife that the 41-year-old leader must tap from. He further said it is not yet God's time for Chamisa to be removed from leadership of his party. I was walking with him and it appeared he was appearing a court case. The was a case that had been fabricated against him. As we were walking going towards the court, I looked at the young dynamic leader of an organization and he was so happy, he was unmoved by the plans of his detractors. He was very sober. And I saw that there was so much grace around his life which kept him happy. But here there is a message that I have for the young dynamic leader of that organization. God is saying this season you do not know who is your close friend and you do not know who is happy for you. God said for him to be so victorious of which he is going to be, he should not undermine the advice from his wife. God was saying in as much as she may not have a public voice and may not be known so much by the public and is not a politician by definition He has put so much reservoir of wisdom and understanding in her. The husband has to listen attentively in this season to the wife because the only friend that he can trust in this season is his wife. In as much as his detractor may fight to unseat him, it is never going to be. It is not yet God's time.